Reflection - "Photography: Learning to See"
So I was cleaning out the mountain of paperwork that covered what used to be my desk. In doing so I came across a piece I had written back in the spring. It's an artist's statement I had written for a class. Reading it again reminded me of why I photograph. It's interesting to go back and read things that I've written some time ago and forgotten about. Here is what I wrote. The piece is entitled "Photography: Learning to See." Photography for me began over thirteen years ago on my seventh birthday. I was given a Polaroid Cool Cam; a camera that I still have to this very day. I began to experiment with it and photograph the world around me. I would find myself anxiously waiting for the image to appear from the milky white surface after every shot. I couldn’t wait to see what I had shot. At age ten, my parents, having seen my new found love of “picture taking,” presented me with a Canon point and shoot camera with a 60mm zoom. I thought I was hot stuff with that camera. I shot rolls and rolls of film and was so proud of my zoom lens. I filled boxes upon boxes of photographs. Years went by and I continued to photograph on and off again. It wasn’t until high school that I found my true passion in photography. I helped develop/create the photography program at my high school. I was the kid spending countless hours in the makeshift darkroom (actually a still functioning janitor’s closet). I would teach myself about photography through books and through a wonderful learning process called “trial and error.” I can remember the first time I successfully developed a roll of film. I very timidly loaded the film onto the reel and poured the chemicals into the tank not sure exactly of what I was doing. Then finally, after what seemed like hours, I pulled the film from the reel and saw pictures! I had done it. I felt on top of the world. Then to watch the image appear on paper as I stood in the crude darkroom gently agitating the developing tray back and forth; it was like watching creation almost. I knew at that moment, that photography is what I had to do. For me, being a photographer means being a storyteller. I love to tell the story through my photographs and art. All great stories are a process, just like photography. A photograph, for example starts out as an image seen through the viewfinder. The artist or storyteller captures that image onto the film, exactly as it is seen. Then the film is carefully developed to reveal a piece of the story; the beginning. The artist looks at the negative and decides how to print it. How big should the print be? What should the tone be? How much contrast should there be? Much like a story evolves over time, so does a photograph. The photographer carefully tweaks the image until it appears perfect; when all the Is are dotted and Ts are crossed. Then the story is ready to be told and the image ready to be shared. Growing up in a rather small town in North Carolina provided me with lots of stories or photographs. 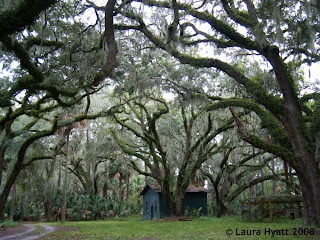 I discovered that there are many stories and personalities that fill the character of the rural south. Each time I stop along those dirt roads that wind through the backwoods “middle-of-nowhere” kinds of places I find stories to tell. The stories of the old buildings, the stories of the farmers, the stories of the land, their history, and I want to tell those stories through my photography. I want to capture what is there, what lays before me, and what is unseen. I need to tell the stories of these quickly dying places so they won’t be forgotten. Now, with only one year left in my college education, I find myself looking out into the world and feeling even more passionate about photography and telling stories through this art form than ever before. I want to capture those images that tell the story of small town America. The town where the old man still drives his pickup truck he’s had for 30 years. The place where you can still find bait, dog collars, and books sold at the same hardware store. The place where everyone waves at you as they pass by in their truck, regardless of whether they know you or not. The community that was built on farming and a simple way of life, that now sees the strip malls and super stores on the horizon. The town that was once the heartbeat of America, but is now just a place to pass through. It is these kinds of places that get my heart pounding. I have to tell the story on film. Film. Some may call me a “purist” or “old school” but I love shooting film and I love shooting with old cameras. There’s something that gets me about the old cameras, where the only control you have is the aperture and shutter speed. There is no zoom, no automatic rewind, no fancy buttons, no batteries, or memory cards. There is only you and the box. I find it so much more freeing, to take away “all the smoke and lights” and find you alone with the camera. It slows you down and makes you really look. For isn’t it the looking that we finally see? Lately I’ve been shooting with a couple of rangefinders and a twin lens that I got from a market in China. They are so simple in form. Yet, that allows me the freedom to focus more on what I’m shooting rather than worry about batteries running out or memory cards filling up. Often times I find myself going out to shoot and the only planning I do will be to pick a direction, north, south, east or west. I want to allow the photographs to find me. I’m the photographer who jumps in the car with a full tank of gas and just goes. I might turn around a half dozen times in one stretch of road because I see something that catches my eye. I’ll be driving along and see a road that looks like it might be interesting and just turn off. I don’t really have a specific idea in mind about what I’m looking to shoot, but I know when I find it. As some would say, I “do in order to know.” I like to allow the place and the subject to dictate what I photograph. Sometimes I just click the shutter because there is something subconsciously that strikes me. I just know that there was something inside of me saying “now.” Other times I’m composing lines that intersect or interesting forms in the scene. It’s fascinating to look back on images from a particular shoot and to see these common threads that occur in my work that I might not have realized while shooting. Perhaps several images have the same old light up sign you might see along a two-lane road advertising the local American Legion barbecue. One is tucked away in some old shed, another sits blank in front of a building, and one is filled text with lights flashing. I don’t purposely set out to capture a set of photos depicting the various signs in a given area. Rather, I set out to capture what moves me, what has that gut clenching emotive impact on me. I am not the flashy photographer with the latest equipment and all the lights. I am not the photographer who hires the models to pose for the fashion exposes. I am not the photographer who sets out to make commercially applicable work. Instead, I am the photographer who uses the equipment that lends itself best to telling my story. I am the photographer who looks to the rural landscape and small town America for inspiration. I am the photographer who photographs for me. Most of all, I want to make a difference. There have been many so-called “storytellers” in my life that have made a difference to me and inspired me. I want to pass on that gift to others. It does not matter if I change the world with my photography or not, as long as I know that I have made a difference in it. Last night I attended a lecture by a wonderful photographer and artist, Bea Nettles. Known for her artist's books, Bea has been photographing for over 50 years. She spoke for about an hour, showing images of her work, books, and reading poetry written by her mother. Some of her books were available for purchase last night. I bought one and she was gracious enough to sign it! Check out her website to learn even more about her. 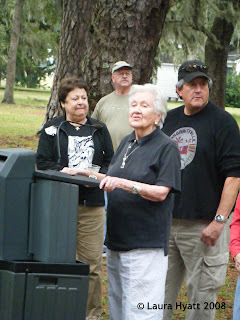 Today I had the pleasure of attending the 2008 Ossabaw Island Pig Roast. What a wonderful event! We took a ferry over to the 26,000 acre island that is now a "living museum of Coastal Georgia History." The once private island is now part of the Department of Natural Resources for the state of Georgia. We had an afternoon filled with great people, delicious food, amazing scenery and a magnificent 1920s home. We were delighted by the presence of Ms. Eleanor Torrey "Sandy" West this afternoon. Ms. West, 96, whose parents constructed the main home on the island in 1924, still resides on the island. She is a spitfire of energy and wisdom. Here Ms. West is giving an unexpected speech to us just after our lunch of barbequed pig, grits, fried chicken, corn pudding, apple cobbler and much much more. Here is a link to a video I took of the end of her talk. 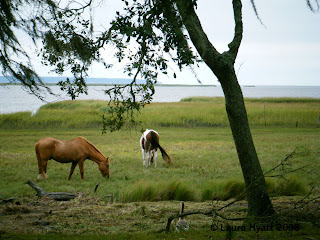 Some of the horses, among other animals, that roam the island. Ossabaw is a natural preserve for many species. Artists, geologists, school kids, archeaologists, and others are welcomed to the island to pursue their studies and to discover more about such a special place. The smoke house is one of several tabby structures on the island. 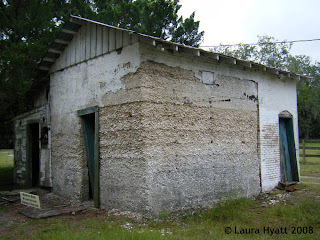 Along with three slave cottages, these uniquely constructed buildings are in the process of being restored to their original state. 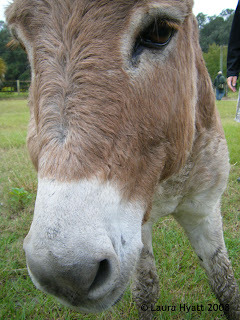 The Donkeys of Ossabaw: There is a small herd of donkeys that freely roam the land of Ossabaw. They came originally from Sicily in the 1940s and eventually found their home on Ossabaw after Ms. West took them in when their owner passed away. Some are very friendly and will even allow you to pet them (like the one in the picture above); others are a little timid. All in all, today was a blast. Such a unique gem. I highly recommend to everyone to make a trip out to Ossabaw Island. You won't regret it. Check out their website to learn more about the unique history and current programs of this masterpiece of Coastal Georgia history. Peter Feldstein set out in 1984 to photograph everyone in his small Iowa town of Oxford. He then rephotographed them 20 years later and recorded their oral histories with the help of colleague Stephen Bloom. Bloom states, "My job in Oxford was to talk to the voiceless." Continue reading the article and view some of the photographs by clicking here.